Great Barrington — Sub-zero temps of late have even the most rugged New Englander wishing they were somewhere else – a faraway place with a warm, gardenia-scented breeze, and umbrella drinks served up as frozen as the Berkshire ground. And while it’s easy to grow tired of parkas and wool, there are aspects to the season that even the loveliest sub-tropical trade wind can’t touch: Collapsing into your favorite chair. Wrapping your fingers around a cup of hot cider (um, spiked, of course) as ceramic warms your hands. Binge-watching Netflix in a daydreamy snowstorm with your family gathered around. Unfolding myself from a bear-like pose is no small thing when the phone rings – especially when I’m tangled between down blankets blissful I have nothing urgent on my to-do list. A friend broke her ankle and needs groceries. A neighbor wants to know if we have jumper cables. And then the calls we wish we didn’t answer. Someone on vacation complaining about the weather: “It’s warm, but not enough for a swim.” I text a screenshot of the weather today — a high of 10 degrees. Looking out my frosted window, I see chickadees and woodpeckers madly gobbling suet to stay warm. I make a mental note to upgrade the windows in the spring – double or triple-panes – anything to make this bone-chilling season less hostile. My mind wanders off to the crazy-big deer that walked across the tundra that is our yard last night. For an instant, the pair stood snowglobe-still. I wonder how they stay warm. The Weather Channel’s on in the next room: “Cold wind chills. Frostbite. Exposed skin. Five minutes.” Maybe Pompano Beach isn’t so bad. Five minutes later, walking from the house to the car feels fabulously refreshing. I flip flop a dozen times a day. Despite a raised brow (or two), I can turn up the thermostat if I’m cold. My work with Construct reminds me on the regular how good I have it. I’m grateful to be warm –especially when I read sobering stats: the amount of heating oil needed to warm a typical home can double in sub-sub-zero temperatures; an average house burns about 7 to 10 gallons of fuel a day in the coldest weeks of winter. My office is toasty. I imagine what it would feel like to see my breath indoors – and to live like that for months at a time. It’s frightening to think this happens in the Berkshires. It makes no difference why some families in our area are in this position. It only matters that they are. 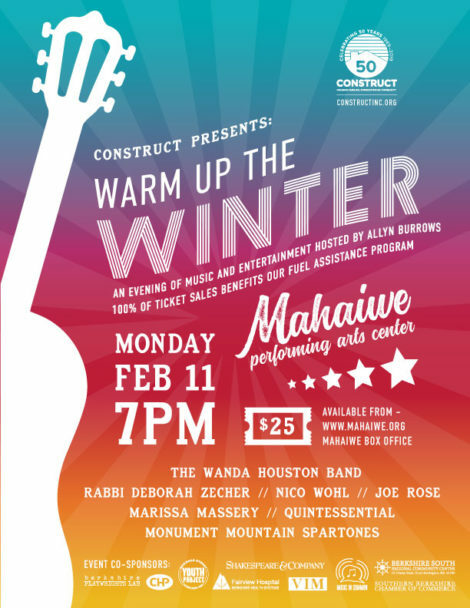 On Monday, February 11, at 7 p.m., join Wanda Houston and The Wanda Houston Band, the Monument Spartones, Quintessential, Joe Rose, Marisa Massery with Chantell McFarland, Nico Wohl, Allyn Burrows and a special appearance by Rabbi Deborah Zecher at the Mahaiwe Performing Arts Center for an evening of great entertainment with 100 percent of the ticket sales going for Fuel Assistance for your South Berkshire neighbors. The benefit is hosted by Construct Inc. and co-sponsored by VIM, Berkshire South, Music in Common, Southern Berkshire Chamber of Commerce, Railroad Street Youth Project, Fairview Hospital, CHP, Shakespeare and Company, and Berkshire Playwrights Lab. Thank you Susie and Construct, for your ongoing efforts to support our Berkshire County friends and neighbors. For 50 years now you’ve provided so many programs vital to sustaining our community, including training for GED diplomas, housing that’s affordable in our rising real estate market, and the fuel assistance targeted by this concert. We are all so lucky to have you in our midst!